OSU Extension Family and Consumer Sciences Educators work through Ohio State University Extension to offer all kinds of information that will help families achieve a positive, healthy lifestyle. Whether you are trying to lose weight through meal planning and exercise, save money for retirement, or balance work and family responsibilities, Extension probably has the answer. March 11-17 is National Extension Living Well Week, and it’s a good time to get better acquainted with your local Extension office. Visit OSU Extension online at http://extension.osu.edu/ to learn more. In recognition of the National Extension Association of Family and Consumer Sciences (NEAFCS), the Ohio Live Healthy, Live Well team is sponsoring a “blog” contest. Please share your “personal story” as to how you have benefitted from the Cooperative Extension Service. 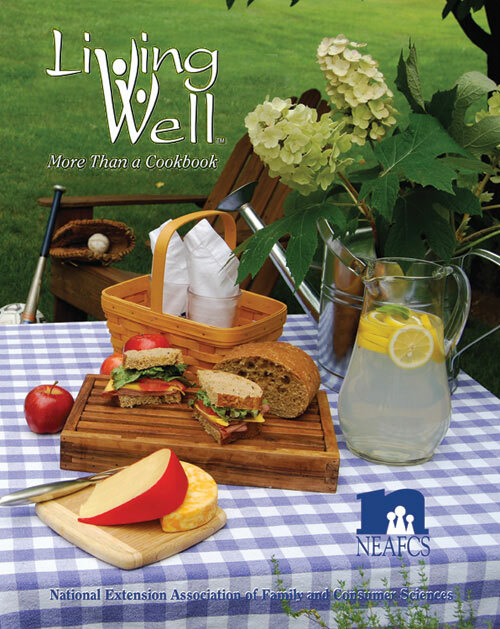 By sharing your story, you will be entered into a drawing to win your own personal copy of our NEAFCS Living Well™ More Than a Cookbook. Please send your personal story to shuster.24@osu.edu by 12 a.m. EST, March 18th. The entrant of the winning entry will be notified via email during the week of March 19. Living Well offers you a world of adventure in food from across the United States including recipes for planning a party or feeding the family. — Thinking of a Western barbeque – check out Montana’s Big Sky Elk Roast or Nebraska’s Cucumber Ranch Steak with Alabama’s Fried Green Tomatoes and Missouri’s Blackberry Cobbler. — Enjoy a Seafood Feast with Maryland’s Crab Cakes or Connecticut’s Clam Chowder topped off with Maine’s Wild Blueberry Gingerbread or Indiana’s Sugar Cream Pie. — Summer Picnics won’t be the same once you serve Hawaii’s Chicken Lu’au, Nevada’s Pine Nut Salad, Mississippi’s Grilled Sweet Potatoes, or Georgia’s Peach Crumble. You’ll find recipes from all 50 states and family favorites from Family and Consumer Science Educators. Members of the National Association of Family and Consumer Sciences deliver nutritional information, food safety tips, preparation suggestions and recipes for Living Well. Writer: Cindy Shuster, Extension Educator, Family & Consumer Sciences, Ohio State University Extension.